It wasn’t your usual progression into racing for Liam, as getting started as you turn 30 is certainly going against the grain. Having travelled to the Nurburgring and watched friends racing, it began as an idea to perhaps have a go at the track and see what happens. From humble beginnings in a Lotus racing at local circuits, to shortly after clinching the a Bathurst 12 Hour Class win in the Lotus, Liam’s racing career has rapidly escalated. The opportunity to drive a Radical SR3 owned by Paul Stokell and Brett Rogers came available and Liam got behind the wheel with the hope to simply broaden his experience. When he found himself at the pointy end of the field, things really started to happen. Under the guidance of David Hardman, Liam continued the season in the Radical while travelling to Germany to gain the required VLN experience to gain access to 24 hour racing at the Nurburgring. Initially, Liam intended to do only one or two rounds in the Radical, but as the events passed, Liam was securing podium placings and found himself leading the championship field. Seeing the potential of a championship in his rookie season, Liam stepped up his training and preparation to new levels. 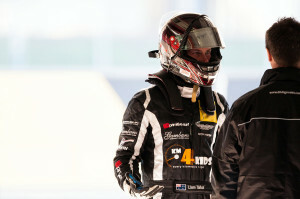 Under the guidance of trainer Tony Hebrard, Liam’s physical and mental strength was tested in training and was further enhanced as Liam began to work with V8 Supercar team Tekno Motorsport. With the experience of a V8 team, Liam was able to enhance his race specific training preparation to give him every advantage. The opportunity to drive the Melbourne Performance Center Audi R8 LMS came up for the Queensland Round of the Australian GT Series and for a first effort in the GT Series, Liam proved that he could hold his own against a significantly more experienced field. By no means has it been an easy season, with many tough lessons being learnt and working closely with engineer Ric Kemp, Liam was guided through the obstacles. The season came to an end at Wakefield Park, with Liam’s personal water supply failing five minutes into a 50 minute race, the gearbox failing and pushing the car in only 4th and 5th gears with Ric’s voice in his ear, telling him to just keep it going. Holding on until the final lap, Liam clinched the points needed and secured the championship win in his rookie season. With a championship under his belt, Liam has his sights set on Australian GT, Nurburgring 24 Hour and Le Mans.